You are here: Home / Diary / Tidy Cats Coupon Mania – and Giveaway! 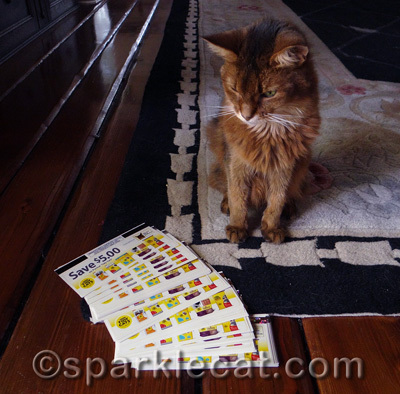 Tidy Cats Coupon Mania – and Giveaway! At the beginning of the month, my human got an email offer from the Tidy Cats humans. If I could quickly put together some sort of logo, they said they would co-brand some $5 off coupons with me. So I told my human to come up with something for them — I figured my readers would want to save on cat litter! I am not sure if this counts as a logo, but they used it anyway! They told me that I would probably be getting around 25 coupons, but when they came in the mail a few days ago, I got a big surprise — there were 150 coupons! I knew I was going to do a giveaway, just not quite this big! So here is the scoop (pun intended) on the coupons: they are $5 off and are good for any Purina Tidy Cats litter, any size, any variety (the only litter that is excluded is Tidy Cats 24/7 Performance LightWeight Litter). The expiration date is December 31, 2014, so you have a whole year to use them. Unfortunately for my international readers, they are only good in the United States. I am giving away a stack of 10 coupons (a $50 value) to 9 different readers, plus one more stack of 10 coupons to a lucky newsletter subscriber. 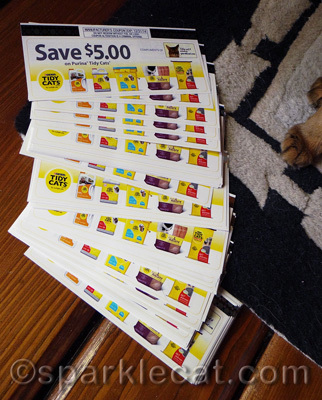 I will also pick one reader who will get the remaining 50 coupons to give to a local cat rescue! All you have to do to qualify is be a U.S. resident (or enter on behalf of someone in the U.S.), and tell me you want to enter in the comments below — and tell me the name of your favorite local cat rescue. I will randomly pick the 11 winners on Monday, December 30! There is also a bonus: when my human went to the Friskies press conference a couple of weeks ago, she came home with a “Buy 1, get 1 free” Friskies coupon. 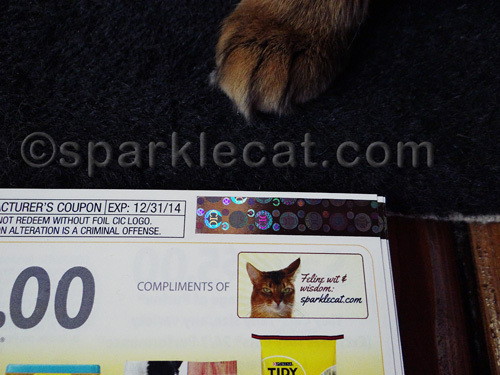 If you want the Friskies coupon, say so in your comment, and I will give it away to the first reader I pick who mentioned it, along with the Tidy Cats coupons. It is coupon mania around here! Good luck! Pawsome giveaway, Sparkle. We use a lot of litter around here with seven cats! 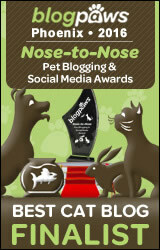 Our rescue choice is Pet Pride of New York, Inc. Good luck, everyone! Purrs. Tidy Cats is our go to litter, the best we have found for our 5 “children”. We would love to win these coupons. The shelter of choice is Homeward Bound Pets in McMinnville, Oregon a wonderful no-kill shelter for cats. I would love to enter! I am not sure of a rescue, but the local Newberry County Humane society could use all the help they can get and have a very nice kitty room. Hi Sparkle! I’d love to enter for the coupons. 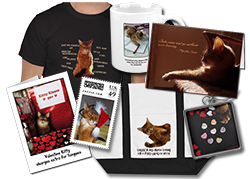 We have 5 kitties and the coupons would help bunches! Love ya! Thanks so much for the amazing giveaway! My favorite cat rescue is Cats Exclusive, Inc, in Margate, Florida! What a great thing!! We would love that and our rescue Colony Cats in Ohio sure could use them too. And we think your picture is purrfect. I’d love to enter. We actually volunteer at our local Humane League in Lancaster, PA.
What a great giveaway Sparkle! Hope you had a Merry Christmas. 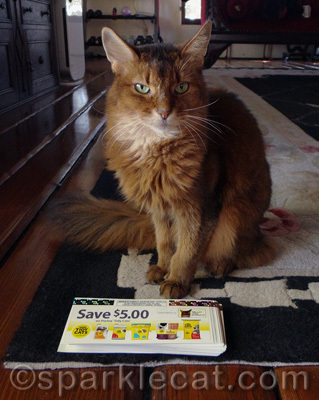 We would donate the coupons to the Forever Home Feline Ranch.